For students who are considering applying for a TRI Fellowship or traveling abroad in the summer of 2017, here are some tips and resources to keep in mind. Your safety and security is our utmost concern; please feel free to contact us to discuss your questions at any time. It bars Syrian refugees indefinitely. ​Yale’s Office of International Students and Scholars (OISS) has up to date information on this and other changes in immigration policy that affect our students. For now, TRI recommends that nationals of these countries, including dual nationals and US permanent residents, avoid international travel at this time. OISS is a great resource for further questions: they have open office hours every afternoon, or you can schedule an appointment. They will be hosting info sessions about the executive order on Wednesday, February 1st and Thursday, February 2nd from 4:30-5:30 PM at 421 Temple Street. Several agencies publish security warnings for international travel. These include the US State Department and United Healthcare Global. Please check the status of your destination country and read up on any local threats and how they might affect you. 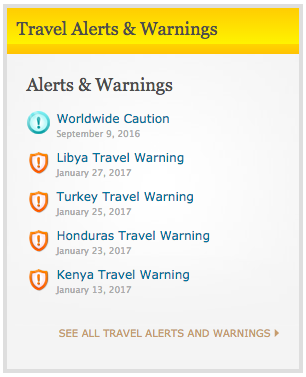 Yale College undergraduates are not permitted to travel (with Yale permission, credit, or funding) to countries that have a US State Department warning, have a UHG threat level of “5 (very high)”, or are otherwise prohibited (presently North Korea and Iran). Graduate students are not subject to the same restrictions, though proposals that could endanger the applicant or study subjects may not be funded. Please consult with TRI staff to discuss your concerns.